The Chromebook Classroom Podcast: Do we have a Chromebook Crisis? Are Chromebooks good for more than math games and web research? This is one of the topics that I discuss with Andy Losik, elementary STEM teacher, during this episode of the Chromebook Classroom Podcast! 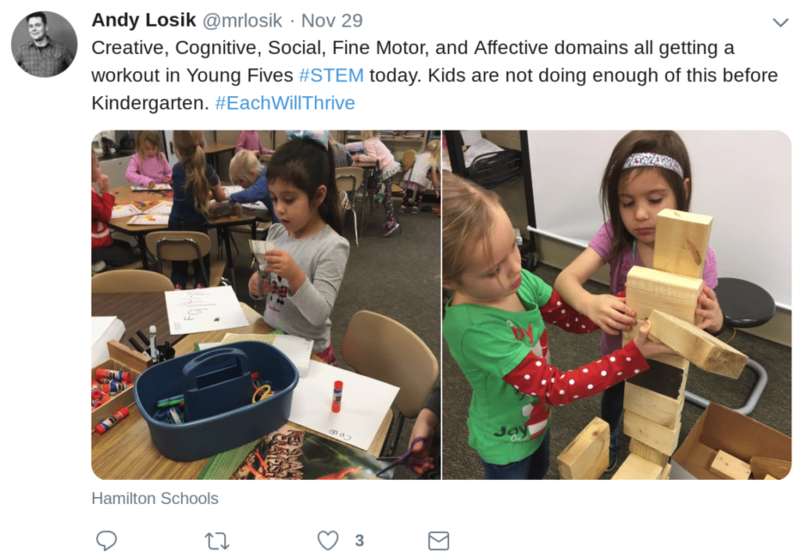 Andy Losik (@mrlosik) is a PK-5 STEM teacher at Hamilton Schools in west Michigan. Andy has a rich background as a classroom teacher and technology expert. He is an Apple Distinguished educator, Google Certified innovator and Discover Education Programs Champion, and helpful guy. Andy teaches a pretty cool class – elementary STEM. Andy has built and developed this class for more than a decade. His overall mission was to design a class that was unique and focused on creation and exploration. At the early elementary level students explore various stations, many which involve building and construction. Outside play is a major component of Andy’s class as well. Being based in West Michigan, that means outside exploration is primarily limited to the fall and spring! During the winter his students focus on the technology and engineering aspect of STEM. The STEM class at Hamilton schools evolved from its roots as a traditional technology class. Rather than focusing on isolated technology skills, Andy’s STEM class uses natural experiences (like watching the growth and development of a monarch butterfly) to teach technology skills like taking photos and recording data. How do you Teach Basic Technology Skills? The burden of teaching technology skills AND subject area content can be very overwhelming. How can an elementary teacher manage these two competing needs? Andy’s big tip is to find a mentor or “tech expert” who can support your use of classroom technology. You DON’T need to be a technology expert! You need to be an expert in teaching your grade level and subject area. Educators like Andy work hard to stay up to date on the latest trends, tools, and technology integration ideas. Are Chromebooks better than iPads? Surprisingly, Andy does not teach in a 1:1 environment. Hamilton schools has purposefully made a decision to maintain a ratio of roughly 5 students for every device. Andy has access to iPads, Chromebooks, and Macbooks. These devices rotate between classrooms and can be reserved as needed. I ask andy to share his thoughts on iPads vs. Chromebooks. Which one is better for the classroom? It’s an uncomfortable question, but Andy does a nice job explaining his thoughts. Ultimately, the best device is dictated by activity. Having a goal for each class period and selecting the device that will help you reach that goal is essential. 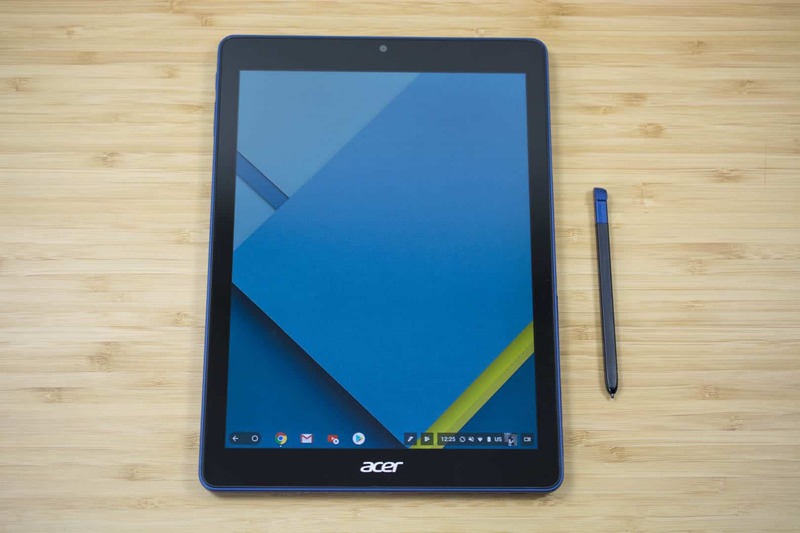 Acer recently released the first ChromeOS tablet. At the time of recording this episode, rumors about a high-end Chrome tablet were swirling. We now know that those rumor were true as the Pixel slate was officially announced in October of 2018. This is a valid, and well documented, issue for Chromebooks. 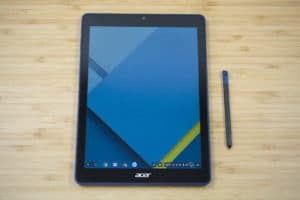 Google’s response has was to bring Android applications to Chromebooks. The promise that Android apps would fill the missing pieces for the ChromeOS ecosystem haven’t been fully realized. Neither Andy or myself have been blown away by the addition of Android to ChromeOS. Chromebooks have wonderful classroom potential, but it appears that this potential is largely untapped. While there isn’t anything inherently wrong with math games, flashcards, or web research, if this is the primary way that our classroom devices are being used we are missing a huge opportunity. Teachers need to tap into the creative potential of Chromebooks and other classroom devices. Andy shares the “iron chef” framework as a way to encourage deeper learning with technology. The “crisis” that Andy has identified can easily be corrected when teachers mindfully select and use classroom technology to accomplish specific goals and objectives. Chromebooks are wonderful devices. Teachers need better training and awareness on what they can do with these devices, beyond the basics of memory work, web research, and typing papers. Connect with Andy on Twitter and head over to his blog for some ideas to get started! Check out the world’s smallest Chrome device from Asus! Save money with Honey, Andy’s favorite Chrome extension!